This Peach Rosé Sangria recipe will keep you cool all summer long. It’s the perfect make-ahead batch cocktail recipe for your next BBQ! The official drink of summer should most definitely be sangria. I’m pretty sure I don’t have nearly enough influence to make that an official proclamation, but one sip of this Peach Rosé Sangria, and I’m pretty sure you’ll be jumping on the Team Sangria bandwagon, too. What’s not to love about sangria? It has wine, fruit and perhaps a spirit or – better yet – two. I love all of those things separately, so it makes total sense that I dig this Peach Rosé Sangria recipe. It’s cool, refreshing and made for long, leisurely nights on the patio. Most of the sangrias I’ve seen are white or red, but this Peach Rosé Sangria recipe is pretty in pink. Now I’m guessing that some of you may turn up your nose at the “pink” wine. I know this because I thought the same thing before I discovered rosé wines. To which I now say, “Where have you been all my life?” They are not – repeat NOT – white zinfandel. 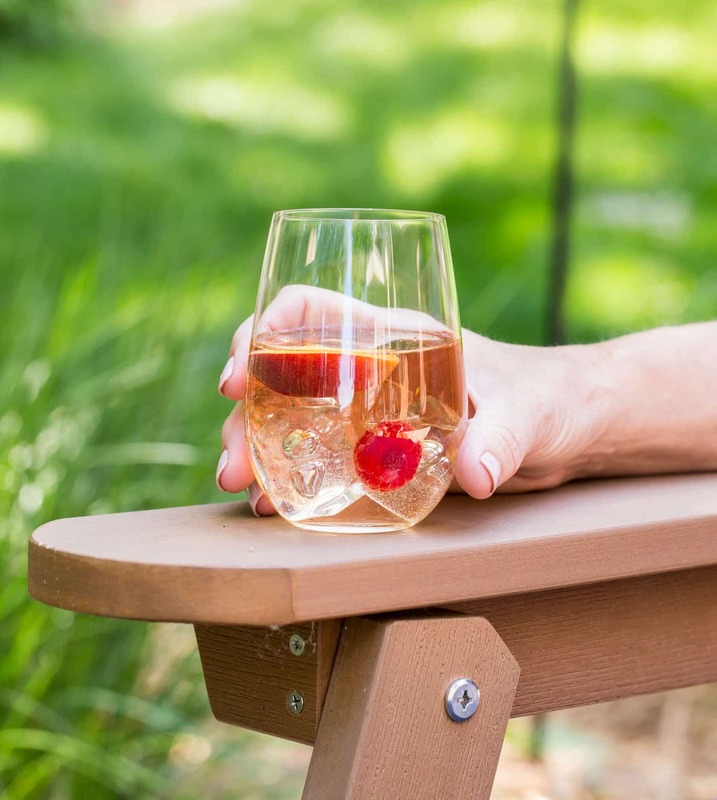 Although I’m the farthest thing from a sommelier, trust me that if you enjoy a crisp, refreshing sipper for spring and summer, you have to seek out and sample a good rosé. Tip: Feel free to swap in other fruits here as you like. Nectarines and strawberries are great options if you don’t have peaches and raspberries on hand. This Peach Rosé Sangria makes a fantastic batch cocktail for groups and entertaining because everything is done in advance. 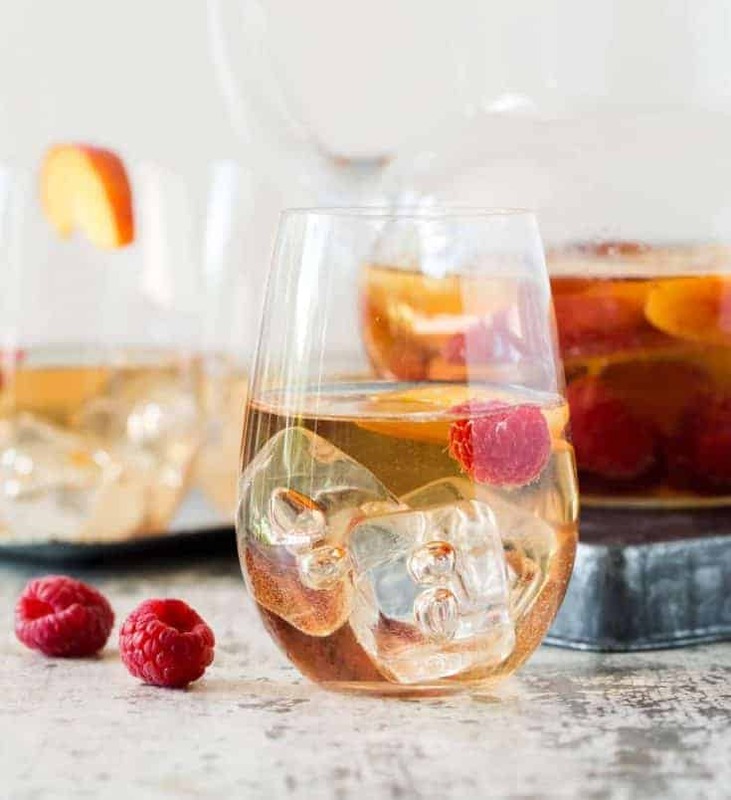 Combine the rosé wine, elderflower liqueur, brandy, peaches and raspberries in one large pitcher and refrigerate for up to 8 hours. Once guests arrive, all you need to do is give the pitcher a quick stir before serving. That’s my type of entertaining. P.S. Rosé not your thing? Don’t miss our Cucumber Melon Sangria and our Sangria Lemonade! Toni also makes a killer Moscato Sangria and Karyn’s Red, White and Blueberry Sangria is perfect for the fourth of July. Place all ingredients except ice in a large pitcher and gently stir. Refrigerate for at least 2 hours and up to 8 hours. Gently stir again before serving. Add ice to pitcher and glasses before pouring. Psh! 9am only means it’s 5:00 somewhere, Nicole! My kind of summer drink-I love it! i could definitely kick back and relax poolside with one of these sangria’s right now, (shame it’s only Wednesday)… wish the weekend would hurry up so i can! Well, I LOVE snagria and love peaches, so this is surely a winner! Me, too, Heather, and this sangria does not disappoint Rosé lovers! The creators, founders, picture-takers and dish-washers behind Garnish with Lemon. Thanks for signing up! We'll be in touch with our latest recipes.